Option # 1: Become captain of a team that will join you for the walk / run and together, collect funds for women and children victims of conjugal violence. Option # 2: As an individual person, come to walk /run with us the 24 of April and collect funds to help women and children victims of conjugal violence. 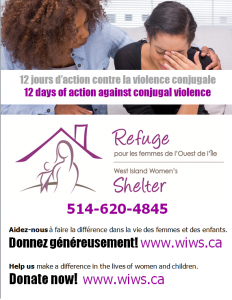 Option # 3: Sponsor a person or a team registered in the charitable challenge and contribute to help us make a difference in the lives of women and children victims of conjugal violence.